Working with metal is a craft of its own. Some experts have many years of trial and error and learning what’s best. Just like any other handyman craft, metalworking involves having the correct tools. Without them, your dead in the water. Metalworking can range from cutting and welding all the way to carving just to name a few. Today, we wanted to take the time to cover in depth what you need in your tool arsenal to effectively get the job done and call yourself a real metal worker. So in no particular order, we go over 21 different metal working tools, why you would need them and other helpful tips and information. Working with Metal, What Will Be Needed? The list could go on and on, but we know you wanted to find out the top tools needed for working with metal. So, what do you need to work with metal and what are the best tools to use overall? Below we have compiled our top 21 tools you need for metalworking and why you need them. A metal bandsaw is a saw with a sharp blade with a stretch of sharp teeth between two or more wheels. A good metalworking bandsaw is an absolute essential for anyone to have that works with metal with any frequency. Bandsaws are versatile and great for beginners. Most beginners aren’t quite ready to work with a jigsaw so a bandsaw is a great starting point. Bandsaws come in a variety of sizes and are commonly used to help cut curves and irregular shapes. You can easily interchange blades to give you the ability to not only work with metal but also with other materials such as wood. A die grinder is a rotary tool used for various purposes such as grinding, sawing, honing and polishing. They can also be used for machining. Especially when working with metal. They feature flexible shafts and can usually be found for very affordable prices. The most common use of die grinders includes engraving, cylinder head porting and general shaping of various projects. A metal nibbler is a tool used for cutting sheet metal. The tools primary function is to cut the sheet metal with minimal distortion. It acts as a punch and die. It moves in a linear fashion against a fixed die and removes small bits of metal and leaving a “kerf” of about 6mm wide. They are commonly powered by compressed air. You can also find electrical versions. The most common form for the DIY individual is an attachment to the electric drill. It converts it to a rotary motion. Nibblers are going to be great for cutting any small channels or cutouts on any home project. They are also ideal and work nearly perfectly for cutting corrugated sheet metal. The biggest downfall DIYers complain of with metal nibblers is the wasted material they are known to create during the cutting process. The flux core welder is going to come in handy quite frequently. They are great for general repairs and often used for any welding required beneath any water surface. They are quick to use and versatile by the fact that they can be used with an automatic or semi-automatic process. They are also great for mobility. They don’t require a tank of any shielding gas. The press brake is a machine pressing tool for bending sheet metal and plate material. It’s most commonly used however with sheet metal. In most circumstances, you are going to have 2 C-frames form the sides of the of the press brake. This is connected to a table at the bottom and on a movable beam. You can find them ranging in sizes from 3 feet to 20 foot in length. Press brakes are great for small and large applications. Depending on the size of the material you work with will determine which size you should consider. Overall press brakes are a must have for anyone shaping, bending or working with sheet metal. If you’re working with metal you need the ability to cut, shape and mark out pieces of metal. Common marking tools include scribers, odd leg calipers, and dot punches. While they all have different applications, the purpose is similar. You need to mark out the areas you are working with and mark where your cuts and shapes will be. Anyone planning on machining cutting or shaping metal needs the tools in place to mark the work lines and areas of mark outs. Trying to do these task blind won’t lead to any quality work and will ultimately leave you frustrated and disappointed. Your center punch is going to be used to mark the center point of your project. Typically, it’s used to mark the center right before drilling. Drills tend to dance around on you, so a center punch can be help be your guide. It creates a large enough dimple to help guide the tip of the drill. Any project requiring clean precise drill holes will benefit from having a center punch. It should be considered a requirement more than a preference. They are easy to use compared to the benefits they provide. You will want to use a centerpunch for metal holes and metal bits up to ½ inch in diameter. A metal drill press is simply a machine that’s designed to remain stationary or in a fixed position. It typically sits on a fixed stand and is used for drilling holes in various materials accurately. Drill presses are needed for a variety of reasons but the main purpose and need for a nice metal drill press is simply accuracy. Sure, you can achieve average results without one, but a drill press really drives home the perfect hole. In addition, a drill press will help metal swirl patterns, and not allowing your drill to lock up at the bit. Anyone working with metal surely has a nice set of metal drill bits on hand always. They are typically made of titanium or cobalt. In addition, they are hard material and corrosion resistant. Cobalt drill bits are going to be your best bet with metal working. They heat quickly and are extremely hard. They can cut quickly into tough metals such as aluminum and stainless steel. Why would you not need a strong durable set of cobalt drill bits around if you work with metal often? They will be used perhaps more than any other tool you have in the arsenal. Long story short, don’t call yourself a metalworking DIYer if you haven’t purchased a nice set of cobalt drill bits. Thread cutting taps are going to be used to create screw threads or threading. You have two primary forms of thread cutting taps. One is used for cutting and one is used for forming the metal. The tap can be used to cut or form the female portion of the mating pair. Anytime working with metal when you’re going to need the ability to pair a male and female counterpart together, you will want a nice thread cutting tap on the hand. It would be a rare occasion that owning a cutting tap isn’t going to prove to be a highly used and effective tool with metal working. All have various applications and strengths. Depending on what kind of metal working you are performing will determine which saws you need on hand. Outside of a drill and good bits, your saws are going to be the centerpiece of your metal working tools. They will be used most frequently for various forms of cutting, shape creating and carving. Abrasives are your key to finishing and smoothing a finished project. After all the hard work that goes into metalworking and metal cutting, your finished product will require abrasives to smooth and perfect the project. You use abrasives to gain a smooth, reflective flat surface and really add the final touches. All of these will have different properties that can all prove very useful in unique ways. A milling machine is a set of rotary cutters that remove material. They do so by advancing a cutter into the piece of material you are attempting to remove. They have plenty of options for cutter head speeds and overall pressure. The jobs they can perform can range from small individual parts to large heavy-duty jobs. Many individuals would feel a little lost trying to figure if they need a milling machine and why to consider one. We wouldn’t go as far to say a milling machine is an absolute 100% necessity but it’s a great option for any metal working enthusiast that really wants the power of creating. A milling machine can have several different characteristics that can make it applicable to what you’re working on but overall, you can always at least consider a used milling machine to get things going and save a bit of money on the pocketbook. A bench grinder is an absolute essential to have in any nice metal workshop. It can grind basically everything it encounters. It’s a grinding machine that drives abrasive wheels. They are great for rough grinding and sharpening tools. They are also often used to shape metal prior to welding or fitting. They are versatile and allow for a wire brush to interchange with the buffing wheels which allows you to double down on your tool and use it for cleaning and polishing workpieces. You will find bench grinders equipped regularly in any metal working shop or machine shop but if you want to elevate your personal metal working shop and hobby, a bench grinder is a way to go. Having the ability to clean, polish or grind other cutting tools in addition to sharpening other metal working tools around the shop such as tool bits, drill bits, chisels, and gouges is something not to overlook. Having one around won’t go to waste or be a tool that collects dust over in the corner. The most common uses of a lathe are for turning down (removing material) outside diameter of a round tube, rod, or other pieces of metal to make it concentric. Other uses include counterboring, facing, drilling, tapering, threading, and shaping. Lathes come in handy whether you are running a small metal fabrication side hustle from your home garage or have a full-time metalworking shop. We would consider a lathe more of a want than a need as you could always outsource the types of parts it can create. However, if you are looking to carve out your own niche in the metal fabrication arena creating specialized precise pieces you could garner some extra jobs from other local fabricators in your area. This may not be the most fun tool on the list but usually, when you have metal working, you run into welding. Anytime you have welding you should consider investing in a durable darkening helmet. An auto-darkening helmet is not only going to protect your eyes from the glare but also protect your face in general. Anyone who welds with any frequency can attest to the importance of the safety and visibility of an auto-darkening helmet is going to provide when welding. They may be a bit costly ranging anywhere from 150.00 to 500.00 but they are well worth the price and should be part of your toolkit. A sheet metal roller would probably not be the first piece of equipment you would buy for your shop but it would certainly add to the variety of projects and jobs you could perform. Sheet metal rollers can do more than just rolling flat sheets. Most rollers have radius grooves at one end of the rollers to allow you to also roll round rod and tubing. Most fab shops would start out with a roller that has the capacity of ¼” thick steel up to 48” wide which would allow you to do most of your fabrication projects. Sheet metal rollers are not a necessity if you are a new shop or if costs are a factor but you can always build your own sheet metal roller and save yourself some money. Angle finders are another quality tool to have on standby when working with metal. Quality angle finders will be constructed out of stainless steel or aluminum. Having a set of angle finders around is also never going to be a tool that goes untouched. Surprised wire cutters weren’t mentioned during the first 18 tools we recommended? This is another essential for obvious reasons. I think we all know the applications wire cutters can be used for. 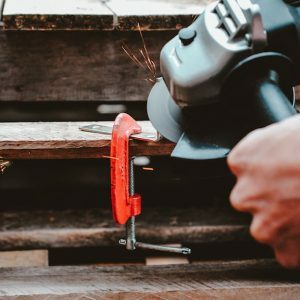 If you own a shop or work with metal often, it would be a mistake not to have a sturdy, durable pair of wire cutters on hand always. C- Clamps and Vice Grips temporarily fasten multiple pieces or sheets of metal together or to your workbench while working. C clamps and the various styles of vice grips will probably be one of the tools you will use almost on a daily basis when working with any type of metal work. They are a must-have next to your workbench because they can reach deep into your workbench and clamp tight around thick materials making welding and assembly fast and efficient. If you are just starting out in metal fabrication this would be a necessity and at the top of the list to purchase early on, you won’t regret it. This can include anything from grinding wheels to abrasives. The most common grinders and disc consist of cutoff wheels or flap disc. In most applications, your grinders and disc will be used for finishing a project and can be used for wire wheels. Another easy must-have tool for all metal workers. Your Turn, What Tools Do You Recommend for Metal Working? Did We Leave Anything Out? There you have it. That’s 21 Tools we believe everyone needs to consider if you are a metal worker, own your shop or even just have a strong hobby and desire to learn metal working. Some of the tools listed are wants over needs but overall, they are all tools that should end up in your shop at one point or another. Have we left anything out? What’s a metal working tool you think nobody working with metal should go without? Feel free to drop a comment below. PrevPrevious PostCan You Rejuvenate A Lead Acid Battery?